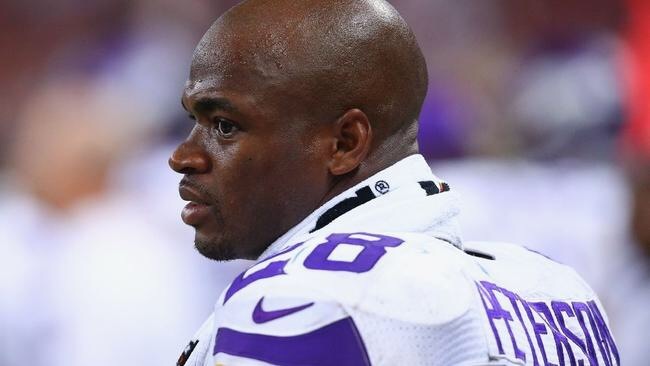 Minnesota Vikings star running back Adrian Peterson was indicted Friday on charges that he struck his young son with a switch in Texas, according to a person in the NFL familiar with the situation. A grand jury in Montgomery County returned the indictment Friday afternoon, according to the person, who spoke on condition of anonymity. Peterson allegedly struck his young son, who spent the summer with the All-Pro running back in Texas, with a switch, according to the NFL source. The Vikings knew of the incident for several weeks, but thought Peterson had been cleared of all criminal charges, the source said. The abuse allegations surfaced shortly after the child returned to his mother’s Minnesota home, according to the source, who said a doctor noticed “a mark” caused by a switch during a routine appointment. Kingsmen White his son is 4 yrs old! They will throw you in jail for disciplining your kids….but they sure don’t mind SHOOTING THEM DEAD in the street when they are older….SMH!!! I see kids acting up in public in front of their parents or parent and I still check they kids! Lol! Dino Simmons I despise delinquent children. SERIOUSLY. On the real though, we have to woop our kids and put the fear of GOD in them! I Like how GOD lets people treat you BAD so he can Push you in another Direction! The End of the CD! What’s Next?